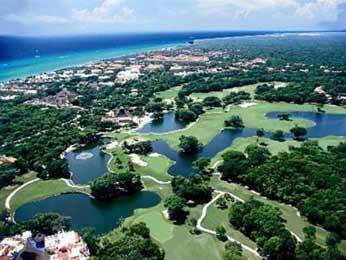 Playacar is the name of the gated community at the south of the city which includes a golf course and various hotels and resorts, offers the most single family homes. The above picture is an arial view of the layout. It is situated for an ordered development. There are two phases in Playacar; phase 1 is very small and private – there is no through street - and is only about 3 blocks from the beach. Phase 2 is much larger with many access points and surrounds the golf course. Of course, Playa del Carmen homes can be found in other parts of the city as well. However, we are taking some time to highlight Playacar´s unique offerings. While there is always the option of buying a house in Playa del Carmen as permanent year-round home, only a small percentage of home owners have chosen this option. Most Playa del Carmen homes are rentals – the majority of owners buy with the intention of using the house with their family only for vacations and visits; during the rest of the year, they rent the house out, so it doubles as an investment, with an impressive income. Purely rental investments are also common; in some cases houses have been constructed or remodelled by builders, and are probably intended solely for rental or sale. According to one owner, ¨Not only can we take advantage of owning a Playa del Carmen home that doubles as an investment (it serves an income rather than an expense! ), but it can also be a really good investment, since the rental income for houses here is very impressive. ¨Part of the reason for this is that the demand is relatively high. In the case of condos, for example, many 2 bedroom apartments are advertised on line, while, as rental agencies have reported, most people come down in groups, so they need 4 or more bedrooms. Although the rental demand is generally being met, the supply is lacking somewhat for the 5 bedroom + category. Also, in the case of 4 bedrooms, the demand is still high enough to make for an excellent rental investment. Another advantage of houses is that there are no condo fees, which tend to be high near the beachfront. Maintenance costs for repairs, maids, etc., can be fairly high too, but this is outweighed by the fact that rental income on homes is much better. Of course, the income and occupancy depend a lot on good promotion and selecting the right managing partner for your real estate needs. At American Development we recognize that value and deliver to our clients.